Publisher: Eidos. Developer: IO Interactive. The ill-fated Kane & Lynch 2 found itself at the centre of a PR disaster even before it hit the shelves, raising uneasy questions about the relationship shared between publishers and game critics. K&L2’s prominent advertisements on a website whose own review didn’t paint the game in an especially positive light, inevitably lead to a conflict of interests, some shifty editing, and a damaging fallout that Eidos couldn’t have envisaged. With so many sources available to gamers, glossing over the true quality of a title seems futile, and as is the way in the metacritic age, angry gamers voted with their user-scores. Ironically enough, the 1/10 protests registered en masse by those who hadn’t played the game didn’t end up all that far wide of the mark, as Kane & Lynch 2 is roundly disappointing and, at times, really awful. It’s a co-op orientated third-person shoot ‘em up whereby you get to play as ‘medicated psychopath’ Lynch, and either the A.I., a friend or an online companion take the role of Kane. The pair blast their way through a seemingly unending sequence of colourless, unsatisfying gunfights chiefly set amongst Chinese alleyways, streets and warehouses, whilst a menial, forgettable story of loss and vengeance plays out vaguely in the margins. There’s a raft of troubles that hamper K&L2, but the most obvious stem from the completely gutless nature of its weapons. The machine guns are laughable, packing all the stopping power of popcorn, whilst in a bizarre contradiction, shotguns are more effective at taking out goons from distance. Each shootout, despite some pleasantly spacious surrounds with plenty of scope for flanking and finding cover, ends up a protracted, depressingly dull affair. You’ll perch behind cover, reticle trained, waiting an age for your target to emerge. You’ll then empty of clip into them, and watch with chagrin as they calmly return to cover and begin the tedious charade again. There’s also no vision to the co-operative element; it doesn’t feel like a team game except for the very occasional bit of flanking or helping your teammate up after being gunned down. There’s even a few of those ‘open a garage shutter’ moments that are so astoundingly generic, they were likely there as waymarkers to remind the developer they were making a co-op shooter. Obligatory garage-shutter opening, cause it's a co-op! As a consequence, it’s mostly negative memories you’ll take from Dog Days, as the gameplay declines further as you progress. There’s a battle in an underground car park that’s frustrating regardless of the difficulty you play it on, as is the sequence that precedes it where the duo are tasked with defending foul-mouthed cockney moron Glazer who, rather than seeking the necessary cover required whilst you dispatch the bullet-resistant foes, likes instead to flounder around in front of them (and you). There’s a rather unnecessary post-torture scene section where Kane and Lynch run around the streets all bloodied and in the nip, and to cap it all off, one of the flattest, most uninspiring endings you could wish to see from a modern video game. The Youtube-style, handheld shaky-cam idea is a commendably original idea. Sadly though in this instance, ‘original’ isn’t a by-word for ‘good’. 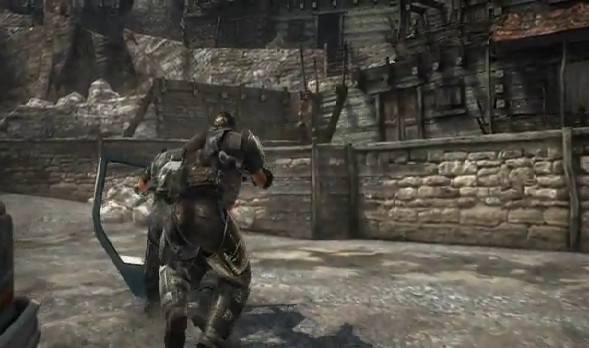 The animation and scenery are fairly by-the-by anyway, but the grain/blur effect is hideous. To an extent, you can deal with some graining, but it’s ramped up so high at times that its genuinely off-putting, with a blotch/blur effect so strong, it makes identifying the immediate surrounds (and enemies hiding in shadowed areas), a challenge unto itself. 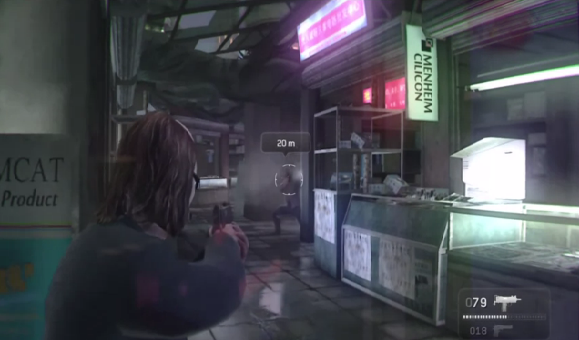 Destructible scenery is the one positive that can be taken from the visual side, as both player and the enemies often have the chance to whittle away each other’s cover spots, as showcased in a neat little section in a wooden-walled bar. Iffy dialogue doesn’t help sooth nagging frustrations that dog the game throughout. For a titular duo, it’s remarkable how little character there is to Kane or Lynch, the two engaging in very brief ‘these are my problems’ speeches but the vast majority of the story sees them swearing loudly at each other and repeatedly asking what they’ve got themselves into. Which in a funny kind of way, forms an appropriate metaphor for the player’s own experiences. Following the main story is about as much fun as chewing a brick, so it’s nice that a bit of relief is on hand in the form of the oddly-monikered Arcade mode. Essentially the player is part of a team of criminals carrying out a heist at such locations as an airport, bridge and a market, with the idea being to collect as much cash as possible and then make off in a helicopter at a designated collection point. The cool bit here is how you wish to tackle it; play as a team and you have a greater chance against the heavily-armed security, but it means having to cut the winnings with your fellow-escapees. Turn traitor and you can nick everyone’s loot, though it leaves you facing an uphill struggle reaching the chopper alone, so timing is key. Taking place over a series of quick-fire rounds of gradually escalating difficulty, Arcade carries a trace of fun missing from the main campaign. It can’t escape problems inherent with the game unfortunately though, with clunky firefights and wildly inconsistent A.I. amounting to a familiar feeling of frustration; the Bridge level saw A.I. doing their part and largely surviving until about the eighth or ninth round, yet the market saw all of my cohorts being killed on the third round within a couple of minutes, before most had even reached the loot. Online, provided you find some players less reckless (and treacherous) than the A.I., makes for a slightly better time of things. The campaign is dull to play alone and surprisingly, even worse in co-op. I played a fair bit of the campaign with a friend and by the end of the session; he looked like he wanted to strangle me for introducing him to it. 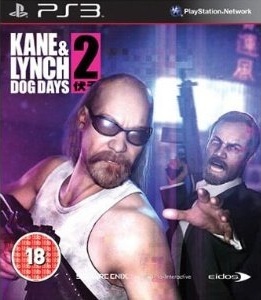 Kane & Lynch 2 is an ordinary shooter setup with an ordinary storyline, lots of little annoyances and guns so poor that they sap all life from the game. Time to lay Kane & Lynch to rest – this dog’s had its day.